Tour the Alpaca: from nose to toes! Native to the high, arid plains of the Andes Mountains, encompassing sections of Peru, Chile and Bolivia, the first alpacas were imported into the United States in 1984. Following a rigorous screening procedure to insure that healthy, well-conformed animals were imported, the alpacas were held in quarantine before entry to the United States. So while the alpaca is a relative newcomer to the States, and there is much to be learned about these creatures, great strides are being made in understanding the needs and care of this animal. We believe in breeding only alpacas that are registered with the Alpaca Registry Incorporated (ARI). When an alpaca is registered with the ARI, it is DNA blood-typed to verify its parentage, and the owner receives a certificate detailing the animal's ancestry. The Registry is now closed to further importation, protecting the value of those alpacas already in the United States. Bred mainly for fleece production, the alpaca stands just a bit shorter than the average adult human, weighing 125-150 lbs. (males 150-175 lbs.). In contrast, the larger llama (bred as a beast of burden) stands quite tall and can weigh nearly twice as much as an alpaca. Due to living for hundreds of years in the harsh conditions of the high Andes mountains, alpacas are very efficient in their use of feed, consuming much less per pound of body weight than a horse or even sheep. 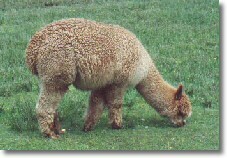 The alpaca is a modified ruminant: it has a three-compartment stomach and chews a cud. They have molars top and bottom, but have no teeth on the front of the upper mandible, just a firm "dental pad" (gums). The front incisors from the lower mandible should neatly meet the dental pad. This allows the animal to snip off blades of grass as they graze. If the front incisors become overgrown, they can be trimmed by your vet. Breeding animals should be selected for excellent bites (among other things), which will reduce the need for this procedure. In addition to a low-protein forage, alpacas require fresh water daily and free choice minerals. An appropriate hay is offered, and many breeders also feed vitamin-fortified grain pellets. Although alpacas enjoy a bit of alfalfa, care must be taken that the diet is not too rich. Depending on the productivity of your pastures, 5-10 alpacas can be pastured on one acre. If room permits, it is advisable to rotate pastures periodically. Alpacas are very gentle to pastures, walking softly with their two-toed feet. The bottom of the foot is leathery, similar to a dog's, and the toenails can be trimmed with rose shears. There may be very little need for trimming if the alpaca often walks on rough surfaces, such as rocks or concrete. If the alpaca walks on soft grass usually, then trimming is needed every 2-6 months. Alpaca's manure is relatively dry, in the shape and size of coffee beans. The beans provide a wonderful, mild fertilizer for flowers and trees, and after composting can be used on the vegetable garden. The gardens of alpaca ranchers often boast flowers nearly twice the size of their neighbors. Alpacas have very tidy "bathroom" habits, depositing their "beans" in a few community dung piles in the pastures. If the alpacas are kept on a small acreage parcel, beans can regularly be picked up- reducing bacterial load in the soil and promoting the health of your animals. In addition to helping you devise a feeding program, your vet can advise you as to the vaccination and worming protocols that are appropriate to your area. 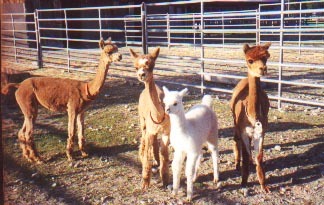 Alpacas prefer to remain in a close-knit group; males and females are kept in separate pastures. Breeding males are sometimes given their own small pastures if necessary to solve dominance issues. Alpacas usually do not challenge fences, but it is important to fence out common predators such as dogs and coyotes. In many areas, the threat of cougar and bear must also be considered. Some owners employ sentinel animals, such as llamas, dogs or geese to sound the alarm in case of danger. Many alpaca owners find their Livestock Guardian Dogs to be indispensable. In the United States, alpacas are raised from Florida to Alaska. They are very adaptable; a few variations in husbandry practices are advisable in areas of extreme cold, or heat and humidity. In many areas, alpacas can be raised without fancy barns or facilities. Simple three-sided shelters may be provided to give protection from rain and stiff winter winds. Of course, outbuildings that can house equipment, hay and supplies are very handy from the human's point of view. It may also be advisable to have an area where a winter-born cria or ill alpaca can be bedded down, away from the harsh weather. Some owners prefer to keep their alpacas in a barn at night, particularly if there is a threat of large predators. The goal of fencing is not so much to keep the alpacas in, but to keep predators out. In many areas, an alpaca's most serious threat is a pack of dogs. It is important that barbed wire not be used for alpaca fencing, since the barbs can catch in the fleece, and there is the possibility of damage and infection of eyes and skin. Board fencing is sometimes used for adults, but would allow predators and crias to pass through easily. Some breeders have found closely spaced electric strand fencing to be useful, while others have seen their alpaca run right through it at full speed: the animal's thick fleece providing enough insulation from shock that the alpaca was not fazed. Many breeders recommend using 2 x 4 "no-climb" fencing: 6 ft. for exterior fences and 5 ft. for interior fences. A "hot" wire is run near the top of the exterior fence, and another approx. 18" from the ground, to prevent digging under by dogs and coyotes. Alpaca social structure is fascinating to observe. Being a herd animal, it is necessary for alpacas to live with at least one other alpaca: "a buddy is good, two is better". Mothers are very protective of their young ones, often putting themselves between the cria and any potential threat. Mothers and "aunties" alike share the duty of disciplining the babies. Groups of males will sometimes neck-wrestle and attempt to establish dominance. Each group of males or females also has an "alpha" individual, and there is a definite "pecking order"expressed at feeding time. Do alpacas spit? Truth be told- yes, they can spit at each other as a means of communication. This is likely to be more frequent if the alpacas are in stressful conditions, such as overcrowded feeding conditions. When you become familiar with your alpacas, you will learn the gestures they make before they spit, so you will have time to "get out of the line of fire". When perfectly happy, an alpaca is silent, munching contently in the pasture. When concerned, he emits a hum that sounds like a question (hmmm?) Mothers often cluck softly to their young crias. Less frequently, a shrieking or honking alarm call may be sounded, such as when a predator approaches or enters the pasture. Alpacas demonstrate intelligence, and appear to have a good memory, recognizing places and alpacas they have not seen in years. They can be "clicker-trained" (operant conditioning) to perform a number of behaviors, such as coming when called by name, loading willingly in a trailer and completing an obstacle course, to amusing stunts they can execute with their "talented" lips, such as flipping light switches and ringing bells. Rather than engaging with humans in rough-and-tumble play like a dog might, alpacas are more cat-like in their behavior. When you consider that they are essentially a prey animal, with no defense other than to run away, it is easy to understand why an alpaca will regard a new person or animal with caution. When an alpaca bestows its trust, it is well-earned- but what a reward for that lucky person!